Shirdi Sai Baba Stories,Leelas and Teachings. : Experiences During The Trip To Shirdi-Sai Devotee Rama Rao. Experiences During The Trip To Shirdi-Sai Devotee Rama Rao. 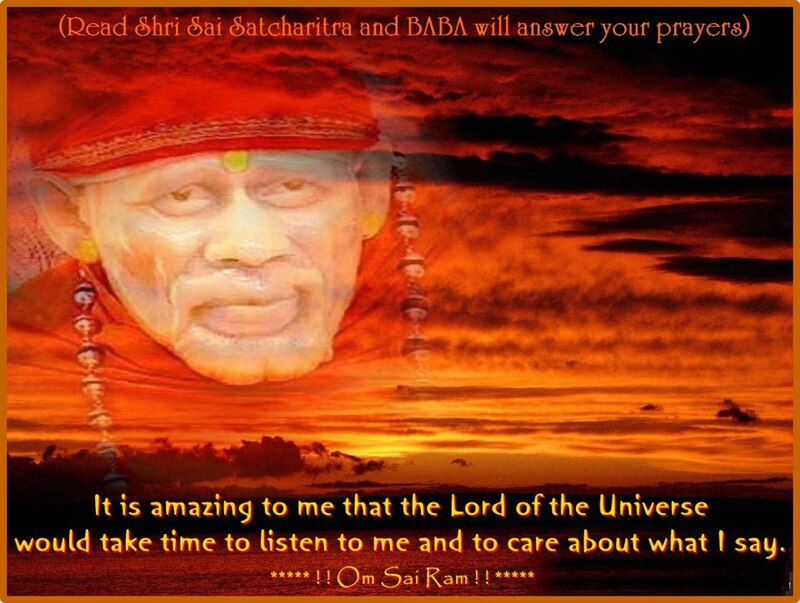 Rama Rao ji has been sharing his experiences and valuable information related to Shirdi Sai Baba on this website. Today again Shri Rama Rao Ji has shared his experiences that happened during his recent visit to Shirdi . Beside this Rama Rao ji has also quoted Baba's words from Shri Sai Satcharitra as a reminder to all devotees to remember Baba's golden words. He has provided a .pdf file for easy download. Jai Sai Ram . I am Rama Rao from Bangalore. 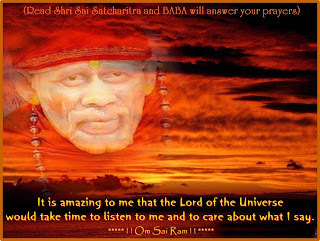 I wish to narrate my trip to Shirdi and the feelings where in, the omnipresence of BABA is distinctly felt.The incidents may look coincidental for the casual visitors of our blog and casual followers of BABA.But not to those who contemplate on BABA always and had similar feelings,incidents and occurances . By this you may get some visions and see certain things which are going to happen or experience certain favourable situations which you have been looking for.This will in-turn increase faith on BABA. This should lead to the habit of following HIS sayings( I attached the pdf file of BABA's words.Please make a link for the readers) which are essential to lead a life which BABA asked us to live. I have been thinking and planning to go to Shiridi for the last 3 or 4 months mainly for Thanks giving. By BABA's call, I could go on 23 rd of this month,September by Karnataka Express which starts at 19-30. On 23 rd early morning,around 5 AM,I was awake ,but not fully,at the same time sleepy .It was a kind of state where one is neither awake to get up nor sleepy.I was completely contemplating on BABA and enjoying the feeling that I am going to Shirdi that day.Had a nice feeling of being very close to BABA at least 3 times.It was a great experience. During that time in that half sleepy state,I saw BABA's left leg(very big white marble) upto a few inches only above the ankle wearing a green shawl with thick green boarder .I could see 2 inches of light green shawl and 2" boarder of thick green boarder attached to it.Total about 4 " on the foot above ankle.I said to my self that it is very nice and left that thought. Later in the morning I encountered a situation by which I thought I may have to cancel my trip. I felt very bad. My family members encouraged me to go if the wait list tkts are confirmed. Fortunately the tkts got confirmed both ways and the tense situation eased out to my satisfaction.I could get return tkt form Manmad ,but not from Kopargoan which I prefer. I have to go to nearest reservation counter to change the boarding point 24 hours before the departure time. Since it was wait listed till noon and then only got confirmation, I decided to board train at Manmad only. Then the taxi. The meru cab driver engaged by me for the drop at station happened to be a great devotee . Through out the period of travel to station, for about an hour,he was constantly talking about temples like Manjunath temple in Karnataka,Sri Sailam, Thirupathi,Ayyappa swamy and Shirdi.He said he attended Harathi and it was very nice. He said he regularly visits all these temples. It reminds me here, I wanted to attend to Harathi this time.I thought I can go there and ask PRO for the pass. but on the day of the journey ,casually I was browsing and found that arathi tickets are being given on line. But they are not available till 25th. My return journey is on 24th.I thought I shall try with PRO at Shirdi devasthanam. At the station--- I reached station very early.I was waiting. suddenly it occurred to me --why can not I give a requisition for change of boarding point in this cantonment station.It was 7-15 PM. Train arrival time is 7-30. Not much time. I had to go to the other side of station.The counter is on the first floor I went there in a hurry. It took considerable time to inquire and go to the supervisor.Hardly 5 minutes left. I requested supervisor. He said I have to give a photo copy of the ticket and the identity proof. I can give ticket,but where to go to get a photo copy of driving licence?I asked whether they have a photo copy machine in their office. He said no. I was just sitting opposite to him disappointed.I said I can give driving licence for his verification.Initially he insisted on photo copy.He can as well stick to it . But suddenly he said, "Ok, show me the identification proof" I showed him. Actually I have to give a requisition on white paper.He mentioned but did not insist on that also. He scribbled something on the Ticket it self, and asked me to go to counter 12.She asked for the identification photo copy.The supervisor came from behind and asked her to change the boarding point.She did it on line.I just returned to the plat form and train arrived. This , I feel is because of BABA's intervention. At Shirdi-- I could get good accommodation in a good hotel at a heavily discounted tariff. The real surprise and joy came to me when I went for darshan. Initially I did not pay much attention to the shawl He was wearing. But after some time suddenly I saw the shawl HE was wearing. It was green with dark green boarder and nice shining buta work.Just the same I saw in the early hours of 23rd in the sleep. I came out of the mandir and went to PRO's office to request for a pass for 6-30 PM Haarathi. PRO said that passes are not given there,and we have to take it only on line.He said he can not help. He then suggested me to join the Q and said I can get Haarathi darshan since the crowd is not much. I joined the Q.There is a separate Q for those who would like to attend to Haarathi. At 6-15 PM they allowed us to enter the temple. I could sit at a place, though it is towards the end of the hall, from where I could see BABA through out with out any obstruction of heads. My wish is fulfilled. While going to bed in the night,I was just recollecting all the happenings without any other thought except contemplation on BABA.I was enjoying the episode of Green shawl . Suddenly it occurred to me, that " tomorrow morning when I go there for Darshan it could be Yellow or gold colour shawl" I slept. Next day morning I finished break fast and went for darshan.This day also not much crowd .Just walked inside. To my surprise and joy,the shawl HE was wearing was GOLDEN YELLOW in colour with again nice buta all over the shawl with mirror work. This narration is not to boast about me and my experiences ,but to let all know about the availability of BABA's cosmic energy which HE HIMSELF said that HE will be available form HIS samadhi. My return journey was also comfortable.I came out of the hotel and was looking for an auto to Kopargoan. I preferred to go in a shared auto without much crowd and ready to spend a little more. (They charge Rs 40 per person in a big van like vehicle and stuff 15 persons,which I did not prefer.) One auto wala demanded Rs 300. Usually they charge between Rs 250 and 300 for a dedicated occupation, without taking any other passengers I said NO.I walked a few steps. Another auto wala asked me how much I give. I said Rs 100 thinking that he would take one or two more passengers as a shared auto.He asked Rs 150. I said NO. He asked me to sit and said that he is from Kopargoan and that is why he agreed for Rs 100(may be since he is in a hurry to return back). After reaching kopargoan, I gave Rs 20 extra ,though he did not demand.He was happy Remember, BABA asked us in "Sathcharithra" to compensate more for the services we get from others. My return journey was comfortable. For people who consider these happenings as coincidence, it is a coincidence.But for many, it could be the pervasiveness of the cosmic energy of formless BABA. Very well composed and written. Baba can take any form as he desires to fulfill devotee wishes just like the auto wala who agreed for rs 100. I agree with your statement that we should always give a little more for the services as baba had said. I always do this and remember Baba. Hail Hail Sainath, Hail Hail sadguru.